The Panoptes SmartIris technology uses iris-scanning technology to identify people in crowds who try to avoid looking at cameras. It uses a set of low-resolution sensors that can combine their data to create high resolution images. Panoptes can locate and identify faces at any angle, and then narrow its gaze to the iris of the subject, even in a fast-moving crowd. 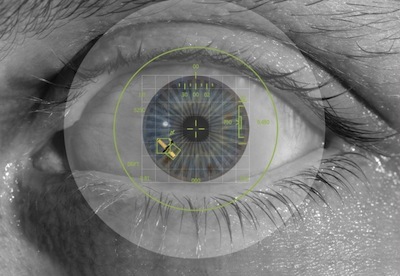 This method of biometric identification was detailed in a patent filing just three years ago; see Covert Iris Scanner for diagrams and more details. In the 2002 movie Minority Report, filmmaker Steven Spielberg shows Tom Cruise's character walking through a mall. As he does so, public iris scanning devices repeatedly identify him, and then target him for personalized advertisements. In the film clip shown above, a "false match" is caused by surgery - Cruise's character has had both of his eyes replaced.